What can we learn from a daffodil? Now, at the end of a long Minnesota winter I am inspired by the daffodil’s audacity as it pushes its way past last year’s leaf rubble with tender/strong green fingers, up into an unknown future. Will the air be warm enough? Will sleet or hail or snow crush the new growth? Or will a too harsh Sun burn its newborn leaves before they’ve had a chance to harden? Our world is full of uncertainty. Dire warnings are coming at a constant staccato tempo. Yet, there is a part of the human spirit that is like this daffodil that pushes forward in spite of these things. The archetype of Aries captures this aspect of the human spirit well. Aries is the energy of spring’s boldness mixed with naïve vulnerability. Aries is one of the most important stories of the moment. The flaws and gifts that Aries possesses and mirrors back to each of us whether we have Aries planets or not, are part of the vital lessons we need to understand as we also push our way into an unknown future. The Aries individual mirrors taking risks, not because she is confident of success but because she has to. Working without a safety net is both a frustrating and inspiring fact of life for an Aries. Wouldn’t it be nice to have a back up plan? Wouldn’t it be great if we could have a little assurance that everything will turn out well in the end? Then, it might not be so hard to step out into the strong currents of life and give it our all. But that is not what Spring teaches and that is not what the world is promising us right now. The world is calling us into our most daring and brilliant selves to become this very current of being, this impulse to be. No safety nets in this circus. Yet, back to the daffodil before my metaphors threaten to implode. Under ground, the daffodil has a secret storehouse—a big fat bulb that it draws upon for survival. Do you have a secret storehouse? What keeps you centered in the flow? Believing in the impossible? Delighting in what life offers? These things are not assurances that Spring will provide us the perfect environment for growth, but they help us to adapt to a rapidly changing, unpredictable world. I think of this bulb as the storehouse of my practices—all the actions I take to be mindful, compassionate, and open to learning. Whatever your practices, we each need the accumulated effort of intention that lives deep inside us for sustenance and support. 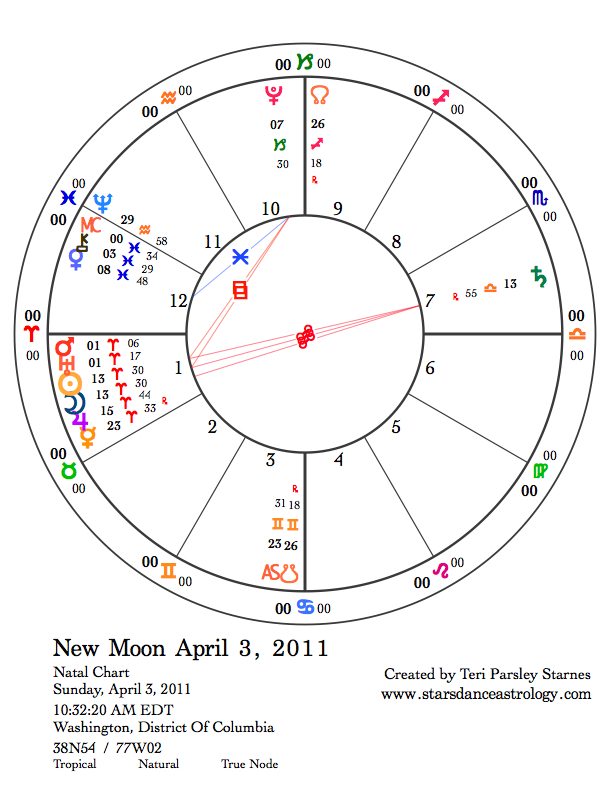 The New Moon chart shows a powerhouse of Aries energy. Mars, the ruler of Aries, is conjunct Uranus; Jupiter is only two degrees away from the Sun and Moon at 13° Aries; and Mercury is moving retrograde through Aries for most of the month. So, there’s that. 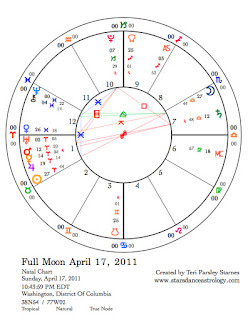 In addition, a stationary Pluto provides extra tension to all this from the Capricorn perspective. I think it is important to remember that while Pluto’s job is to uncover hidden and toxic secrets, it is also about recovering vitality and power. If Aries is new growth, Pluto in Capricorn challenges us to take that mission seriously. We need to be daring however scary it may feel. Saturn in Libra is exactly opposite the Sun and Moon. Oppositions provide perspective and a necessary balancing of forces. Another important part of the story to pay attention to is Saturn’s mission in the relationship sign of Libra. The balance of relationship may be the secret storehouse that allows us to move forward into this Spring. Saturn’s mission in Libra. As the earth teeters under the impact of natural and human actions, we need to cultivate relationship, not only with our fellow humans but with all beings, especially those from the realms of nature: the elementals, the green bloods, the mineral kingdoms, microbes, and animals. Saturn emphasizes the work we need to do. As it transits Libra, this work is around relationship. Relationships bring comfort, but they also bring struggle, the right kind of struggle that keeps us in balance with ourselves and the world. To be in relationship is to feel the pushback of the other. Aries wants to define the Self. That Self needs relationship in order to know its boundaries, obligations, and potential. Cultivating relationship with other beings requires listening to the other, acting with integrity within the relationship, and bringing a sense of deep enjoyment and gratitude to the relationship. I do not think this is airy, fairy stuff. I know that humans can and must be in relationship to rivers, air, trees, and birds. We must know our place in this world to be in balance with it. 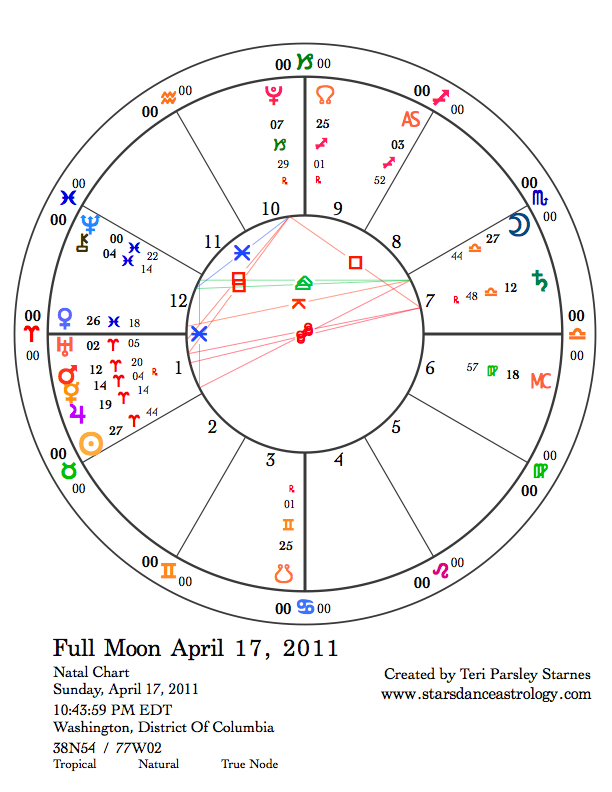 The Full Moon is a time to realize the balance between Aries and Libra. At this time Saturn opposes Mars. Saturn grounds the Martian impulsivity. I want to pay attention to the military actions in Libya. If Mars represents the quick action to go to war, Saturn represents the cost and accountability of that action. 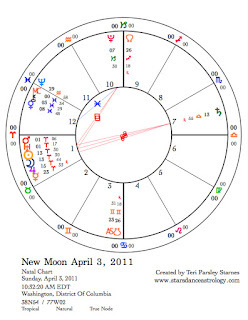 Mercury moving retrograde reminds us that our first impressions are never enough. How do we consciously cultivate wisdom? All the firey energy of this month is cooled somewhat by the god of the oceans, as Neptune enters Pisces. Chiron and Venus, both in Pisces also, add to the soulful lure of dreaming, intuition, and emotions. Aries invites us to action. Pisces opens us to receptivity. This is another very important dynamic to pay attention to. Empathy is a necessary component to relationship. These planets encourage deeper, mystical connection.